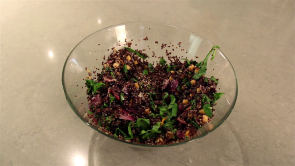 Marni Wasserman of Marni Wasserman’s Food and Lifestyle Shop demonstrates how to make a black quinoa salad. Rinse the quinoa well and drain in fine mesh sieve. Combine water and orange juice (to equal 1 3/4 cups) and bring to a boil in 1 ½ or 2 quart saucepan. Add salt, orange zest, and rinsed quinoa. Return to the boil, reduce heat, cover and simmer for 15 minutes, or until all the liquid has been absorbed. Remove from heat and let sit, covered to fluff up. While the quinoa is cooking, heat the oil in large skillet that has a tight fitting lid. Add the onions and sauté over medium heat for 10 minutes, until they have softened and started to brown a bit. Add garlic and sauté until golden. Add onions, garlic, raisins, chickpeas, and chopped spinach. Add orange juice and zest. Season to taste with salt and cinnamon. Stir well and enjoy!